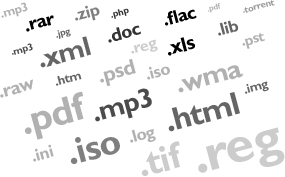 File extension or filename suffix is usually three, four or more characters at the end of computer file names divided by a dot. File extensions are useful to computer programs and operating systems like Windows or macOS (OS X), and basically telling them, what kind of data and file type they are working with and what associated program opens the file. File-extensions.org library contains thousands of file extensions and the database is still growing. A large number of file type entries have detailed descriptions, including their current use and the list of programs that can open, view, edit, convert or play unknown file you search for. Check out the recently published articles related to file extensions, tutorials or software tips. More information about CRDOWNLOAD files - CRDOWNLOAD file analysis. Begin your search by entering the source and target file type specified by their file extensions. For example simply try flac to mp3. Random daily pick from File-Extensions.org's database. visit the common file extensions page, which includes a list of the most important computer file formats you should know. List of the most visited file extension records. Click on the link below for more details and software associations. The file extension database is maintained and improved on daily basis. Here you can check last updated entries.